Germany’s efforts to investigate National Security Agency (NSA) spying are being hampered by Britain’s refusal to co-operate amid threats to break off intelligence-sharing agreements, a German newspaper has reported. 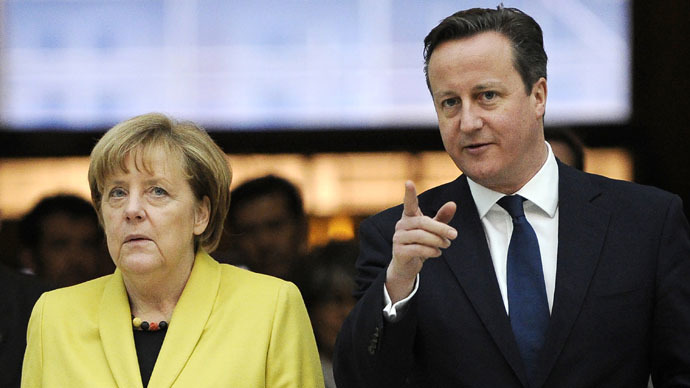 The claims note a heightening of tensions between Downing Street and the German Chancellery over intelligence-sharing. According to German newspaper reports, the Bundestag’s investigation into the NSA could be halted if any UK secrets are revealed. It was revealed in leaked NSA documents that the US spy agency had hacked German Chancellor Angela Merkel’s mobile phone, sparking outrage amongst the German public and fostering a spike in anti-American sentiment. The magazine Focus reported in February that one of Prime Minister David Cameron’s national security aids had written to Merkel’s Chief of Staff refusing to provide help in the inquiry. They also threatened to stop the supply of terrorism intelligence unless Berlin ceased investigations. Germany’s foreign intelligence service, the BND, is viewed internationally as “less than vigorous,” according to the Guardian. They reportedly glean most of their terror information from British and American intelligence sources. “The British possibly want to cover up that they are spying on Germany, not only on countering terror,” the newspaper said. “[Merkel’s] chancellery is baffled as to why the British are being so stubborn … Why are the British so set on escalation? “It’s particularly hot for the British because often it’s about straightforward spying, as well as terrorism hunting. This would definitely be against the European spirit on the continent, perhaps a breach of the European treaties,” it added. The letter to Merkel’s Chief of Staff was met with dismay when it was leaked to the press. Merkel’s aides attempted to persuade MPs on the committee to censor revelations about UK activity, causing a row. The committee members were so displeased that two are currently threatening to take the issue to Germany’s Supreme Court. “The British are horrified that these things could become public via the committee,” a source, said to be a senior German government official, told Focus. It is believed the US currently reviews what information is fed to German authorities on a case-by-case basis, whereas Britain simply refuses.